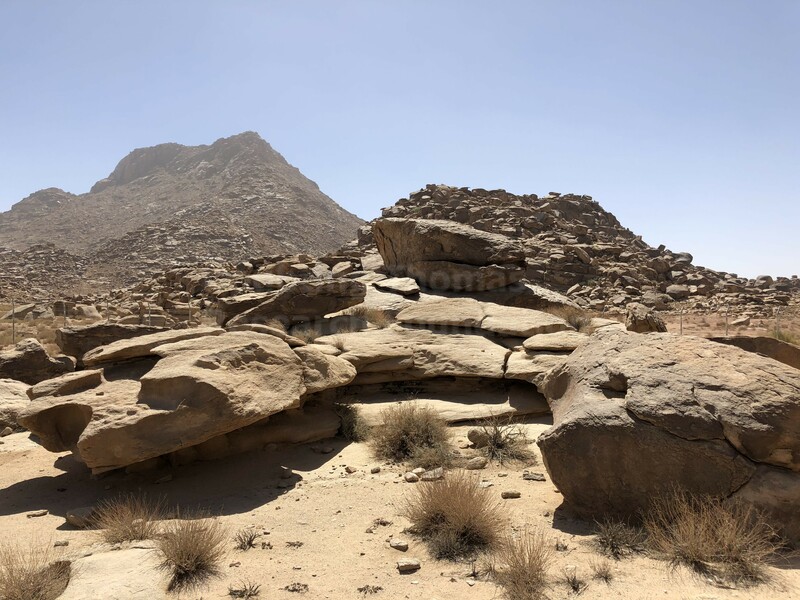 Below is a gallery of pictures from around the entire site at Jabal Maqla, from the top of the mountain to the Golden Calf worship site, all the way to the Red Sea's Gulf of Aqaba. 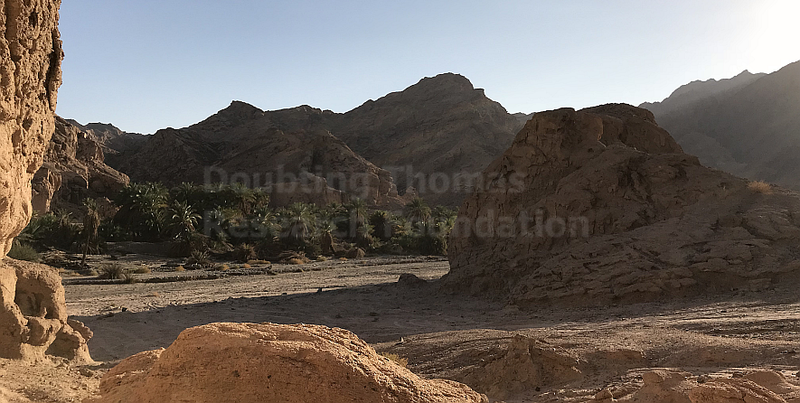 All images are the property of the Doubting Thomas Research Foundation and are protected under United States Copyright law. Looking out from the cave on the moutain out towards the plain. 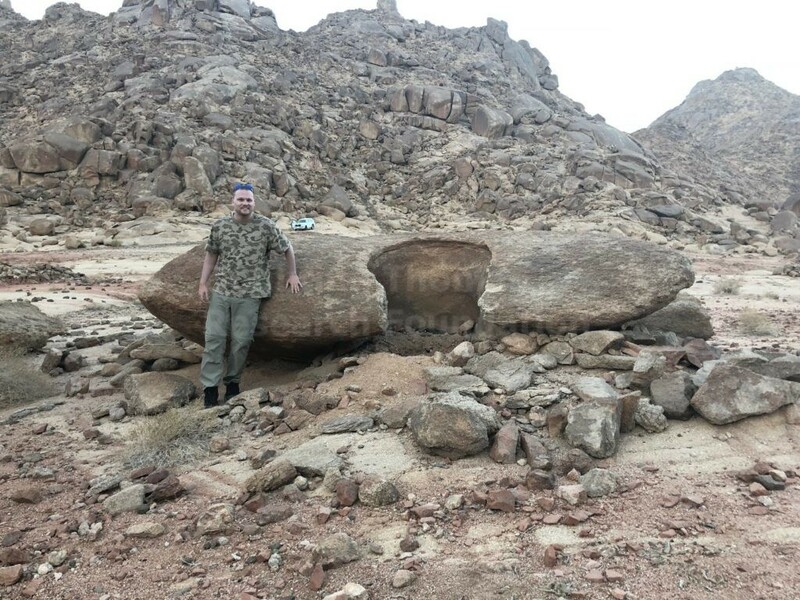 The cleft rock near the summit of Jabal Maqla. 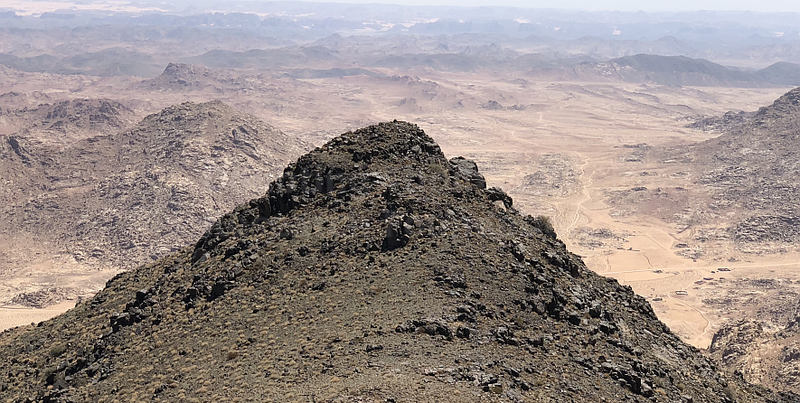 The strange blackened peak of Jabal Maqla. 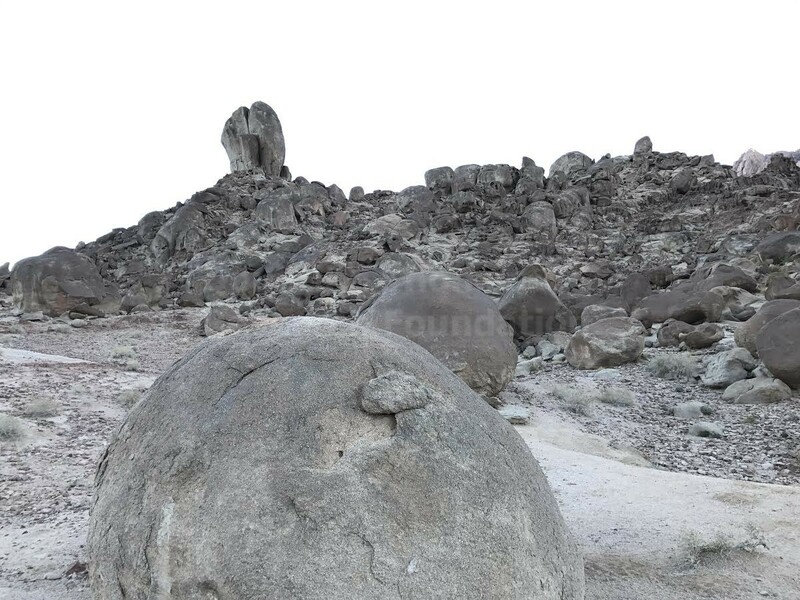 On the plain, just past the mountain's base, there is evidence of water flow. 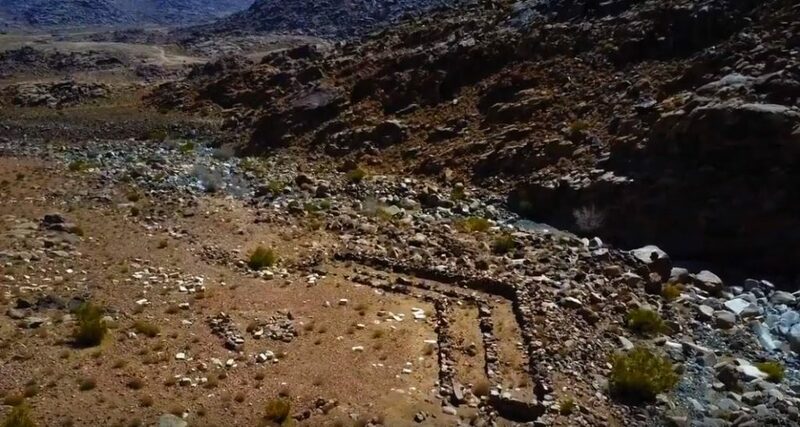 This clearly man-made structure appears to meet the description of how God wanted altars built in Exodus 20. 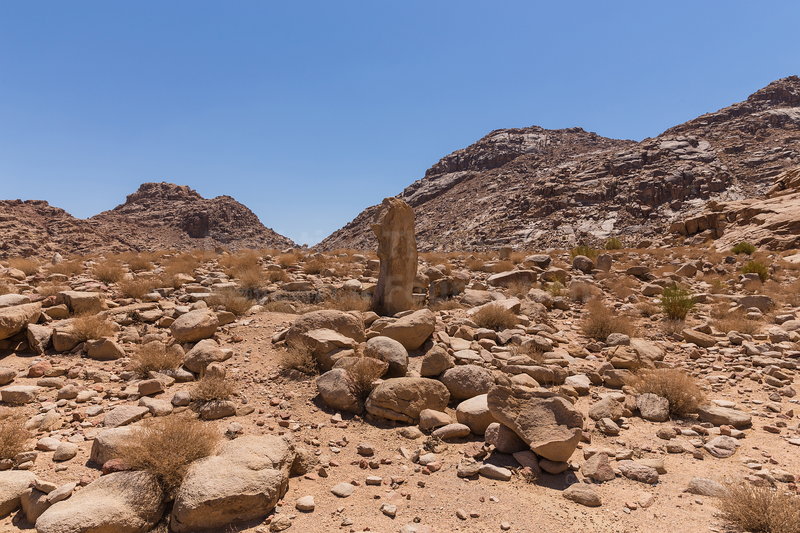 Next to the altar are the remains of about 12 pillars, which could have been erected to represent the 12 tribes of Israel. 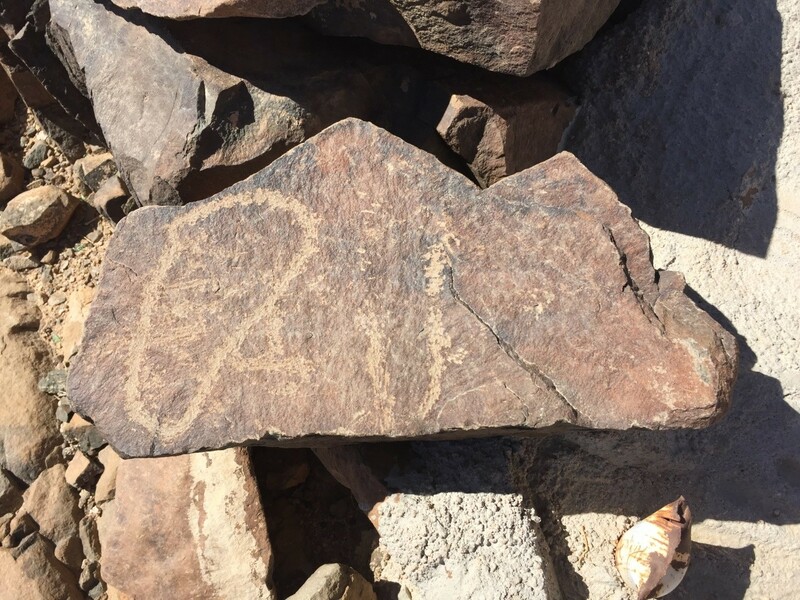 The entire collection of boulders with these inscriptions is fenced off by the Saudi government. 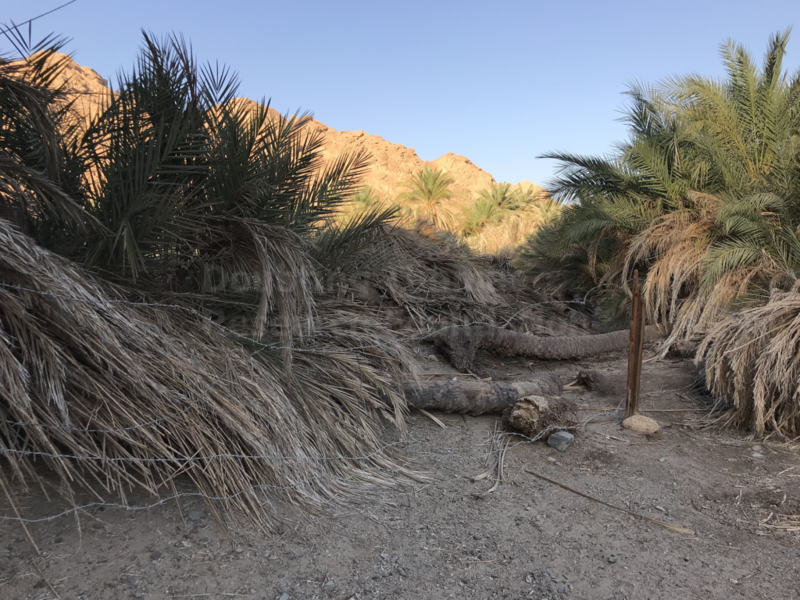 The Saudis have posted a sign in Arabic and English warning anyone curious to stay outside the fence. 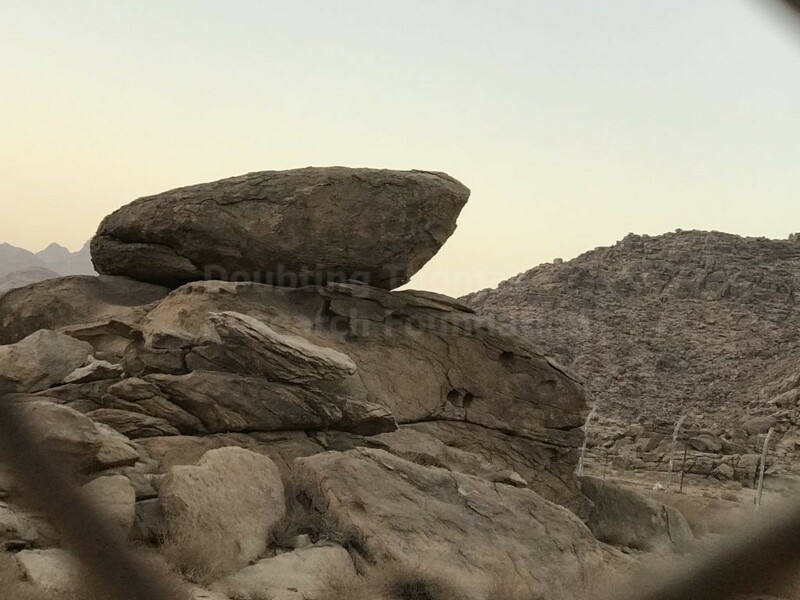 The Golden Calf site from a side angle. 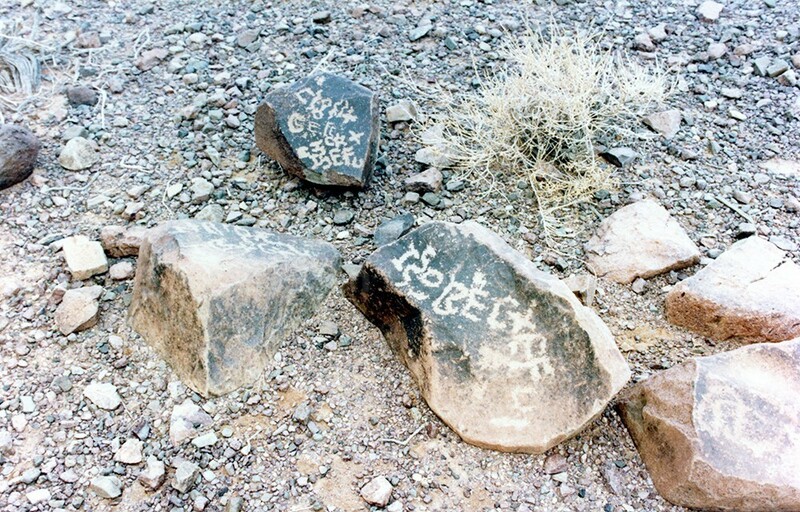 Notice how large the inscriptions are on these rocks. 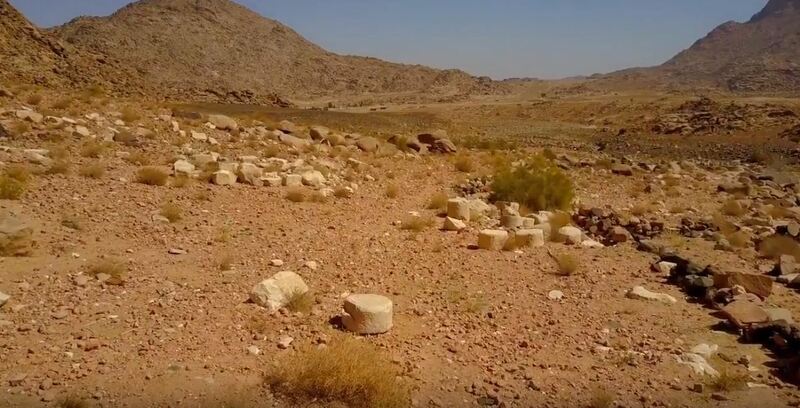 Near the Golden Calf site is pre-Islamic burial ground. 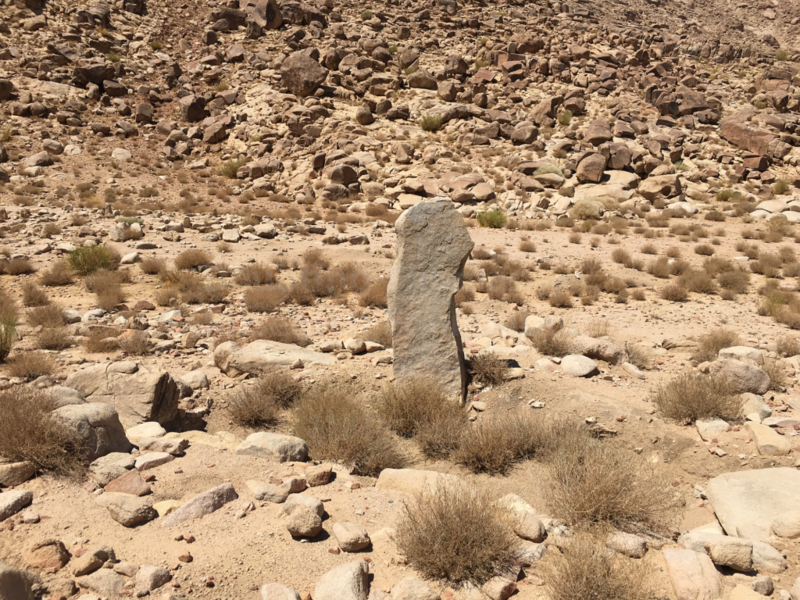 These burial stones are not Islamic, since such stones are forbidden. 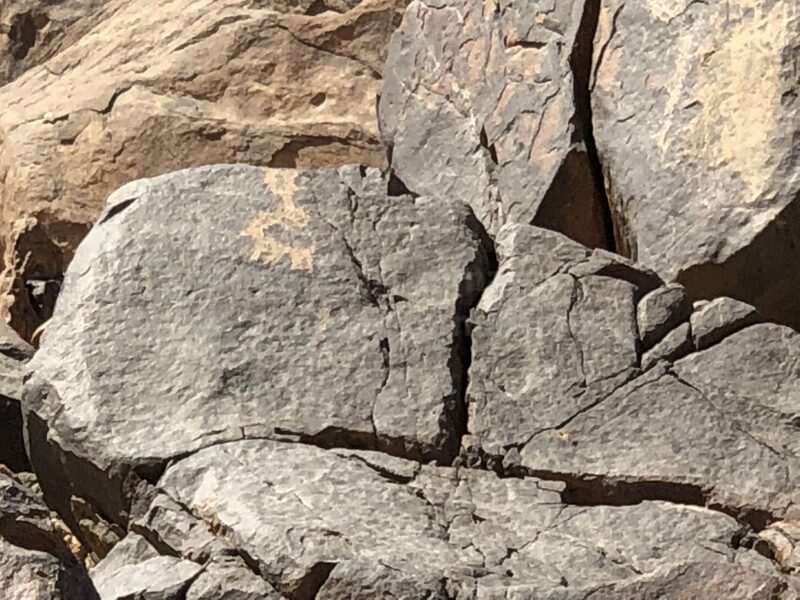 Could they be from the Israelites? 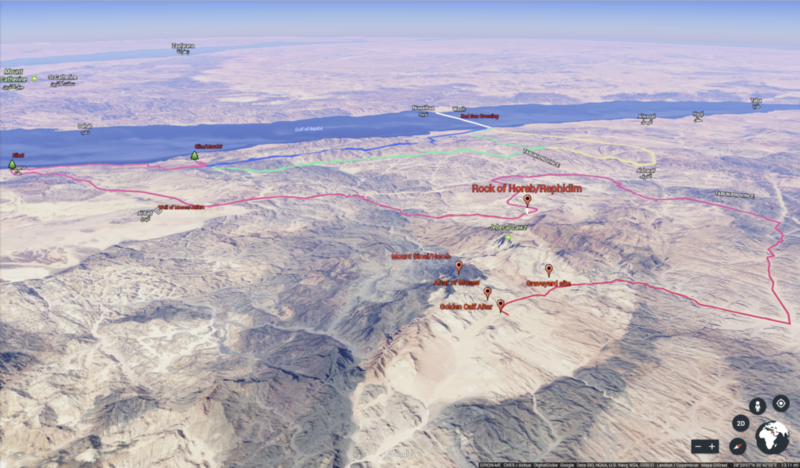 Nearly 3,000 Israelites worshipped the Golden Calf, and God struck them for their rebellion. 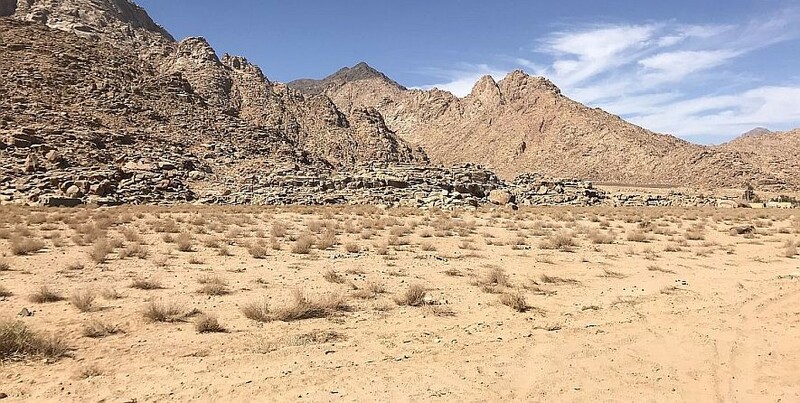 Could this be those 3,000 Israelites' final resting ground? 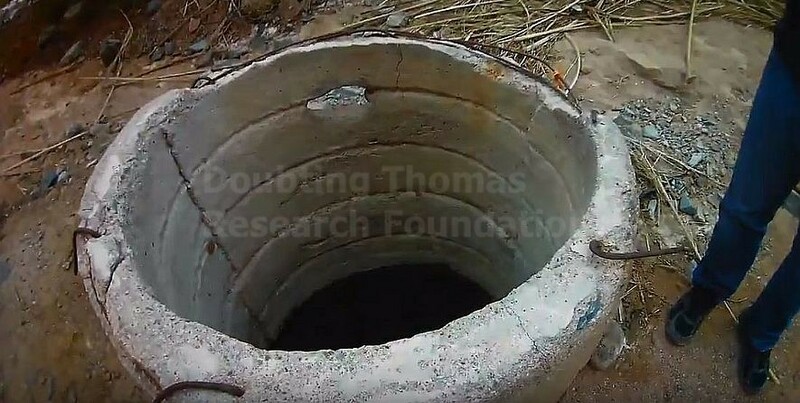 Ryan Mauro explores a well at Elim. 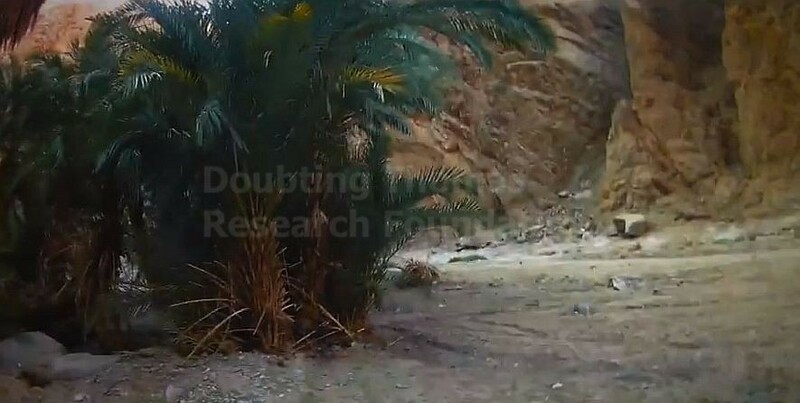 Elim was known to be a place with seventy palms and twelve wells. 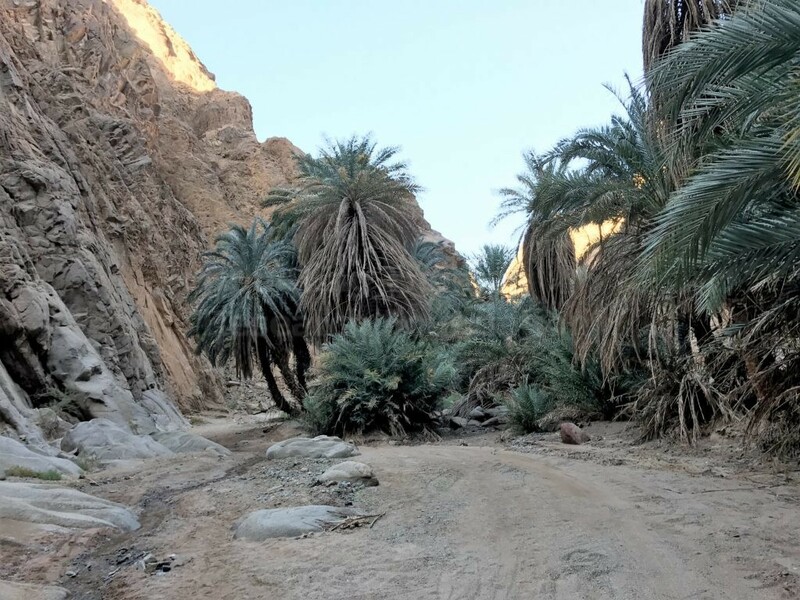 The oasis was known to the Jewish historian Josephus when he was alive in the first century AD. 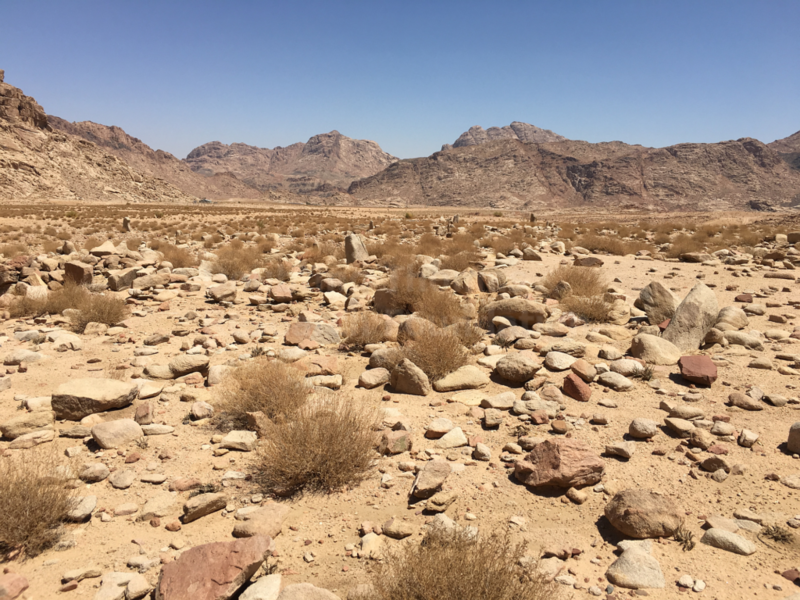 To this day, there are twelve wells at the oasis near Mount Sinai. 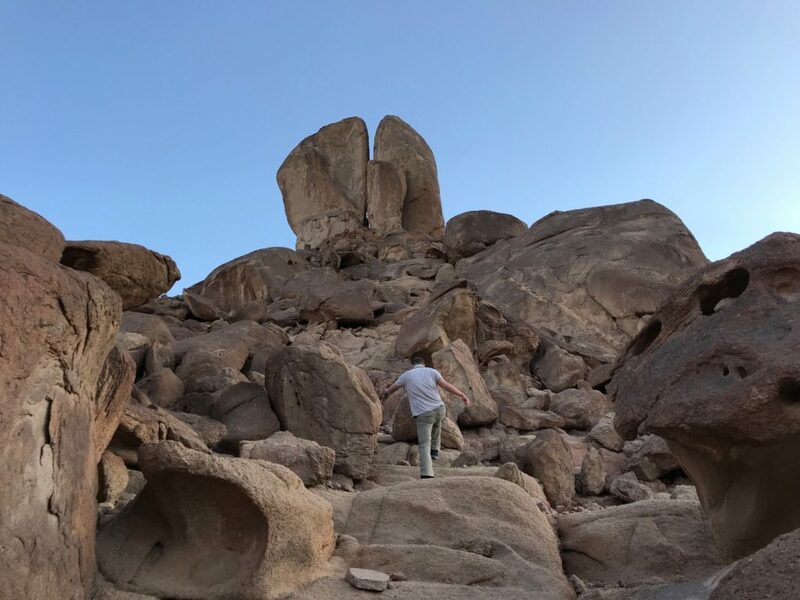 The split rock is perhaps one of the most striking sites near Jabal Maqla. 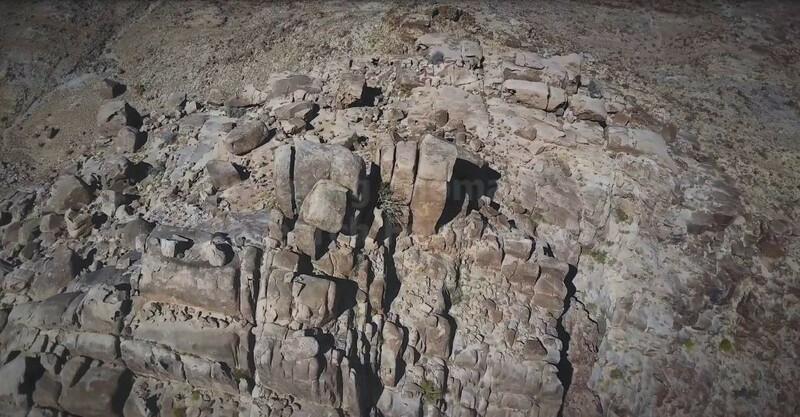 The ground on one side of this massive rock is totally smooth, in contrast to the rock elsewhere in the area. 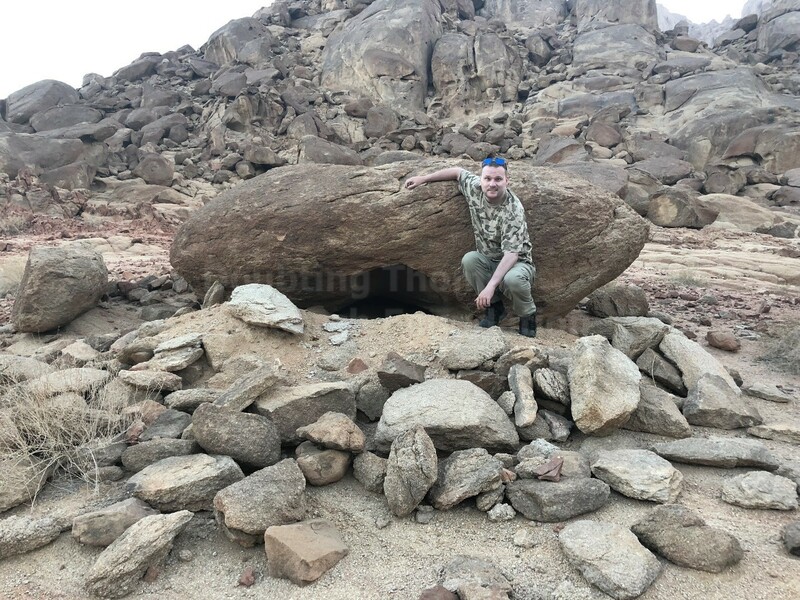 Notice how big the rock is. 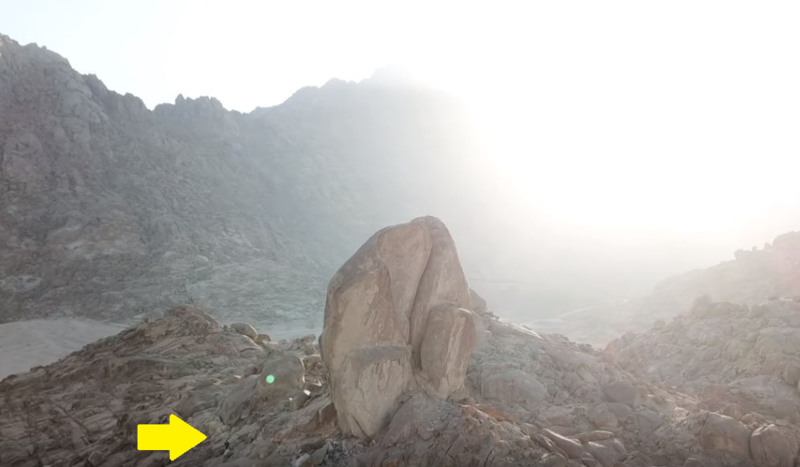 The arrow points to Ryan Mauro climbing up to the rock. 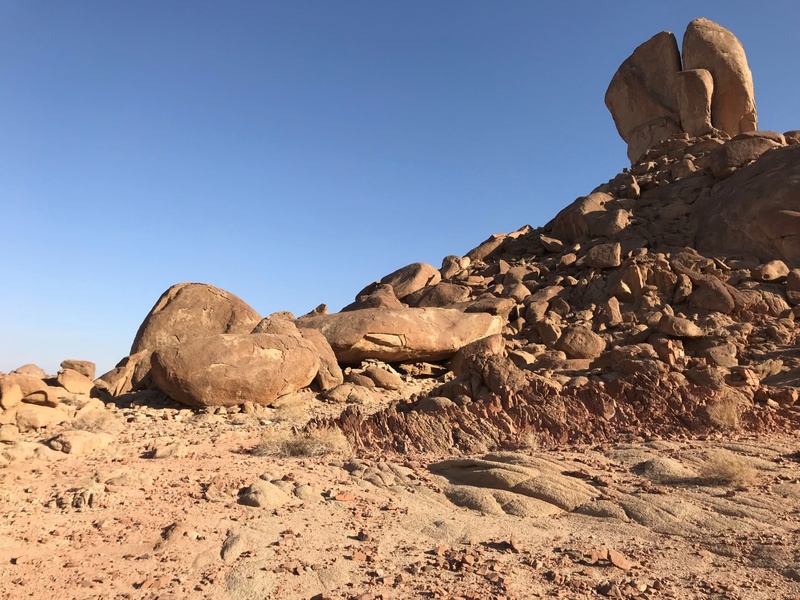 The smoothness of the rock could be explained by water flow. 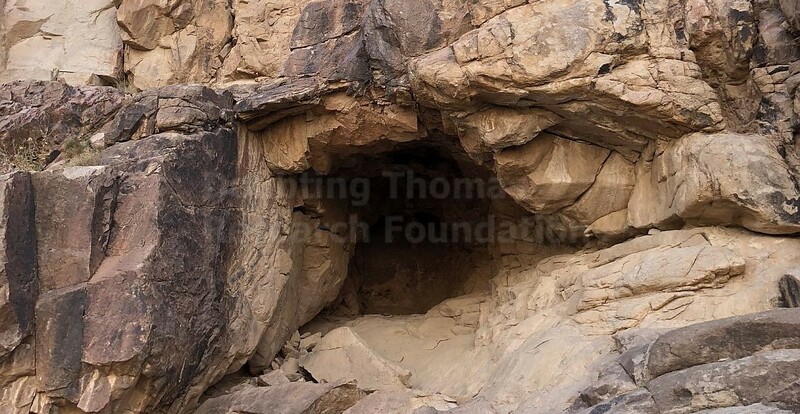 This cave is certainly large enough for Elijah to have slept in if this is to where he traveled. A look at where the cave is on the mountain. 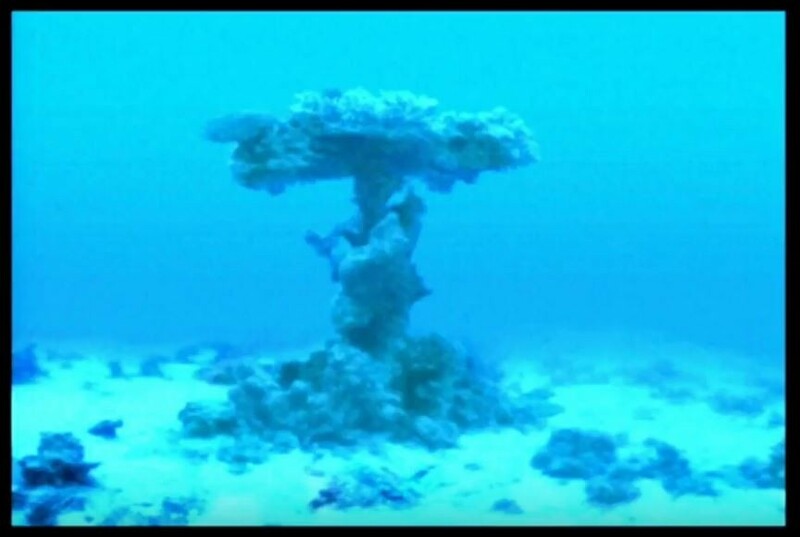 Imagery of coral formations on the Gulf of Aqaba's seabed from Dr. Lennart Möller. 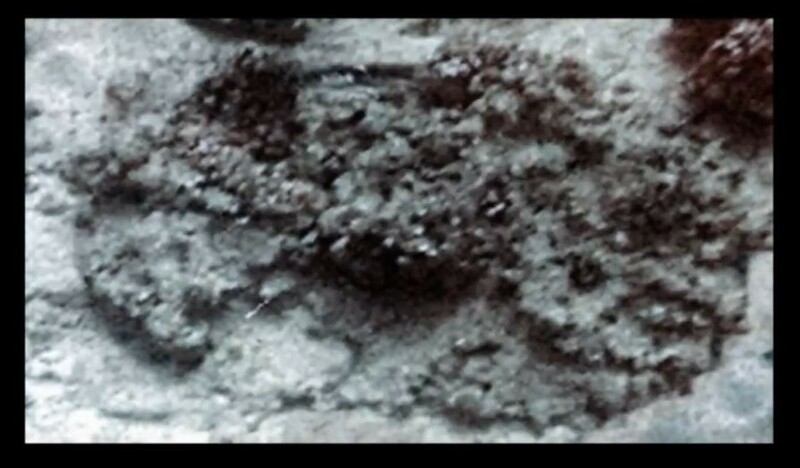 These formations are anomalous, and could be from the remains of Pharaoh's army. 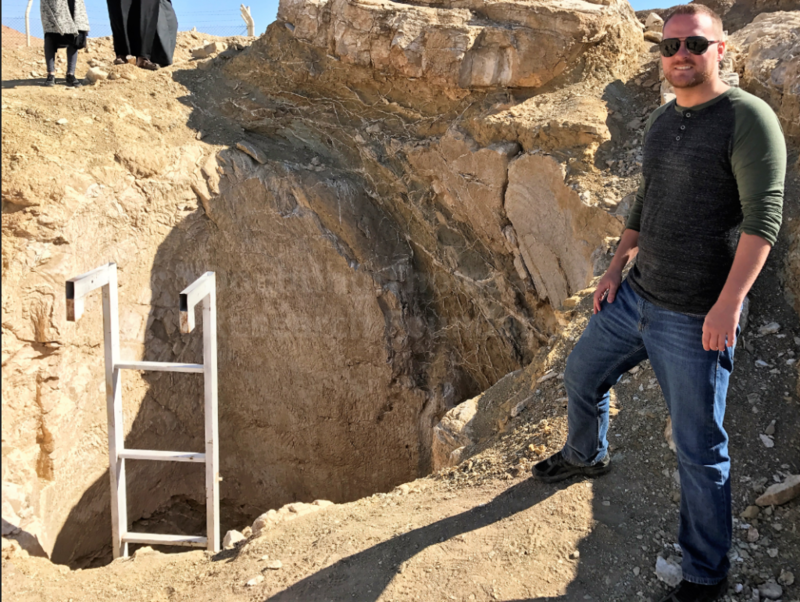 Ryan Mauro stands by the well where Moses may have defended Jethro's daughters. 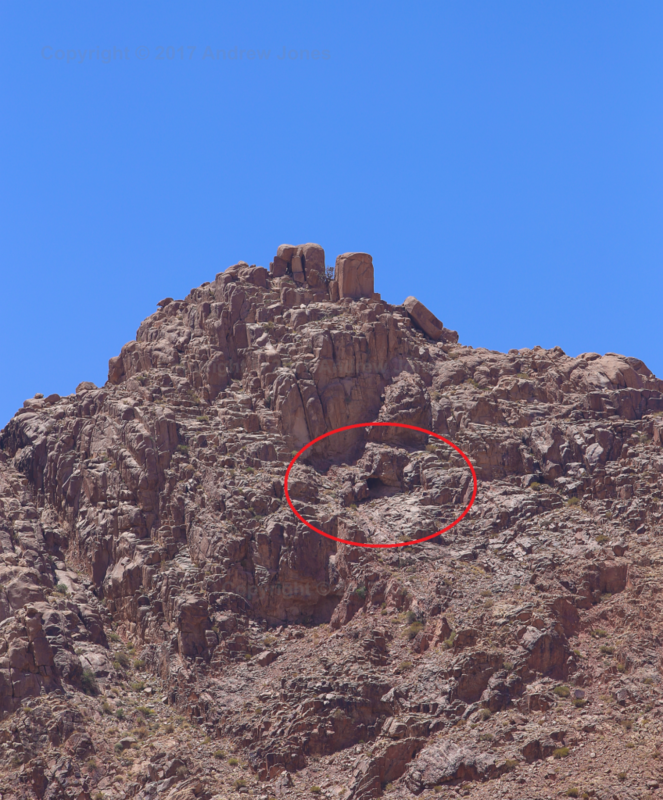 There is a local tradition that these caves belonged to Moses' father-in-law Jethro. 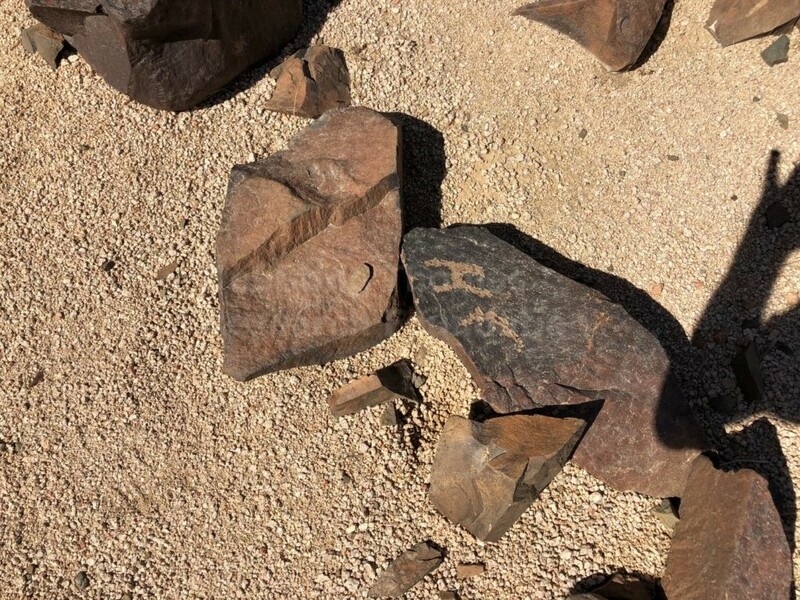 These inscriptions are interpreted as “place of rest,” or “to stretch out,” as one stretches out their legs to relax. 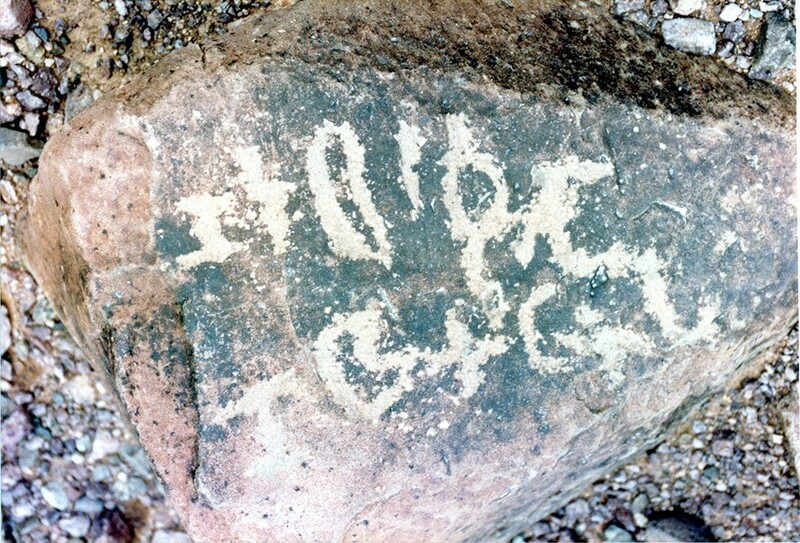 This inscription may reference Yahweh, a Hebrew name for God. Dr. 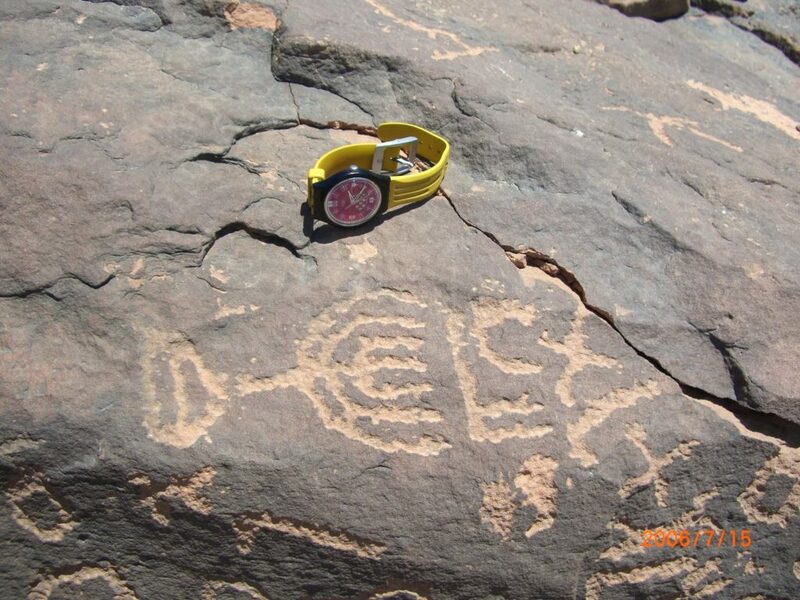 Sung Hak Kim discovered what is likely the oldest-known depiction of a menorah in one of the valleys that leads to Jabal Maqla. This outline of a footprint could have been a boundary marker. 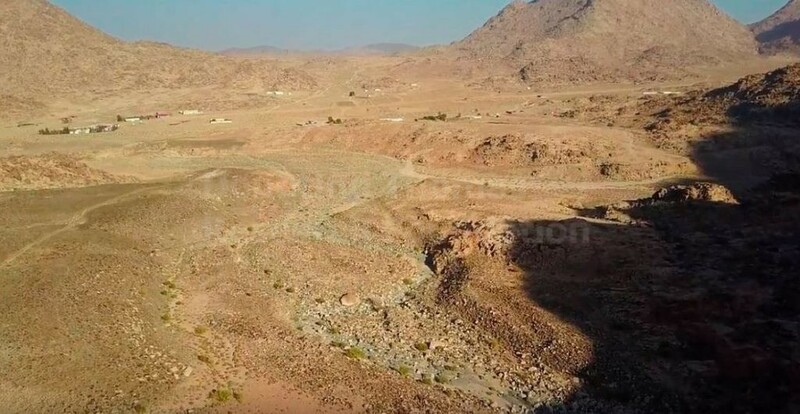 An aerial view of the desert through which we travled to Jabal Maqla. 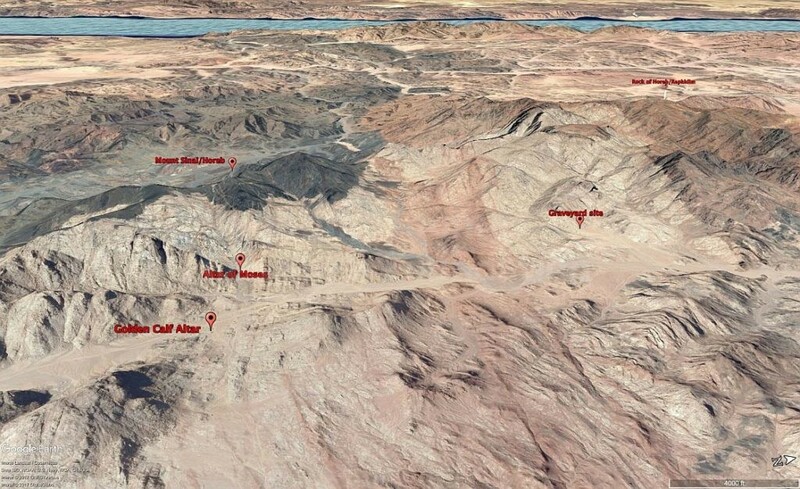 There are two possible locations where the Israelites could have crossed into Midian. 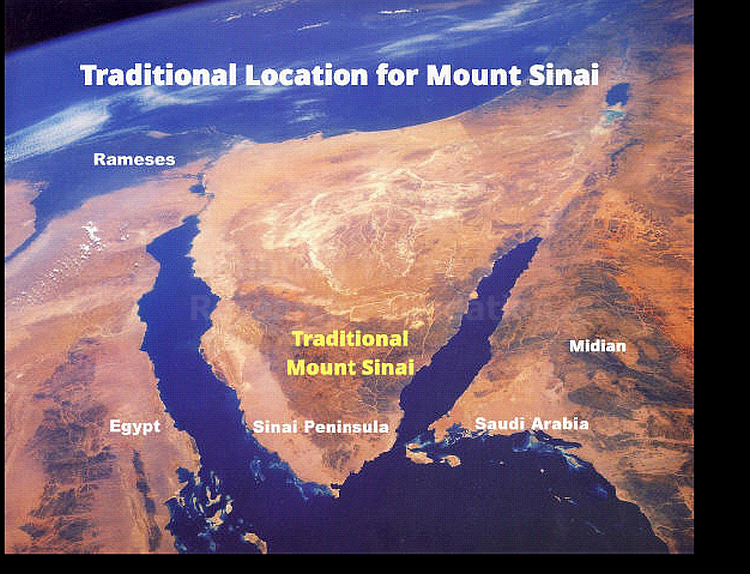 This shows the traditional location for Mt. 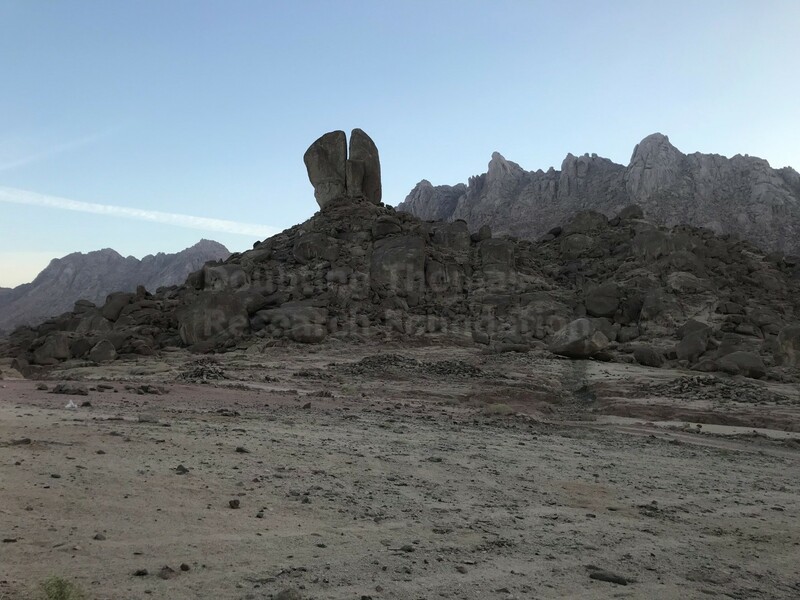 Sinai in Egypt's Sinai peninsula. 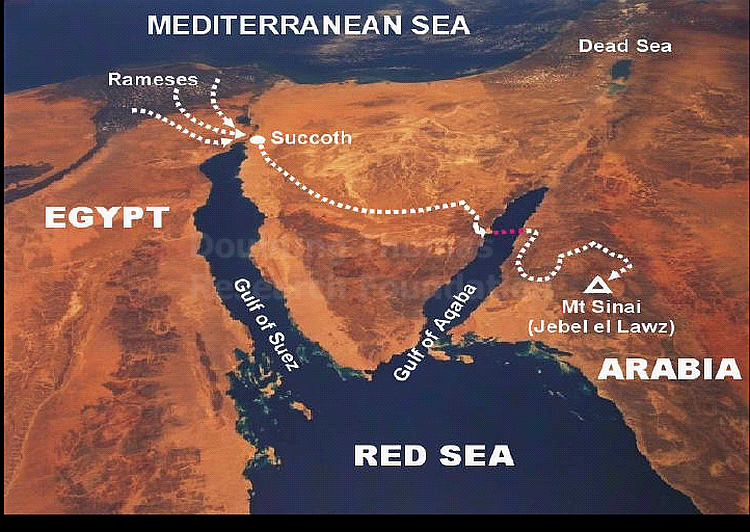 This map details what we believe is the most plausible route by which the Israelites traveled out of Egypt. 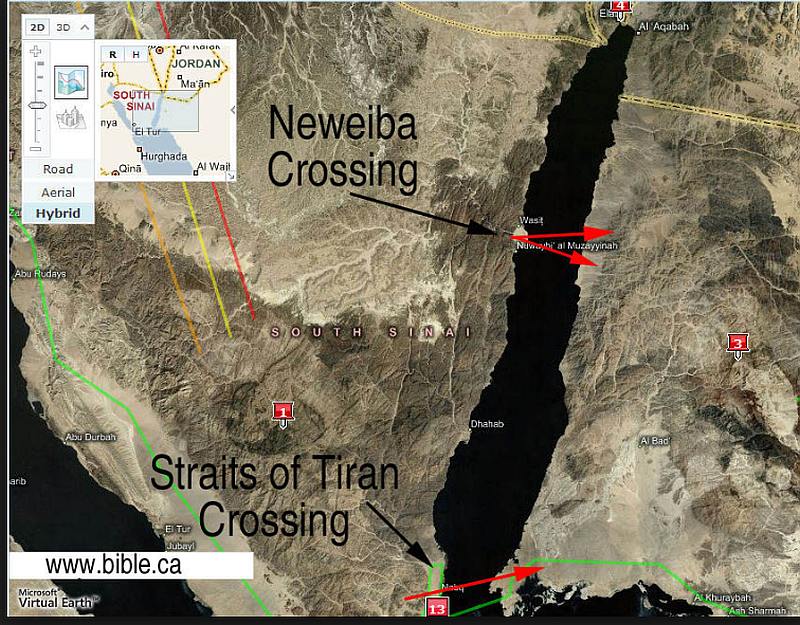 Proposed sites for various part sof hte Exodus story. 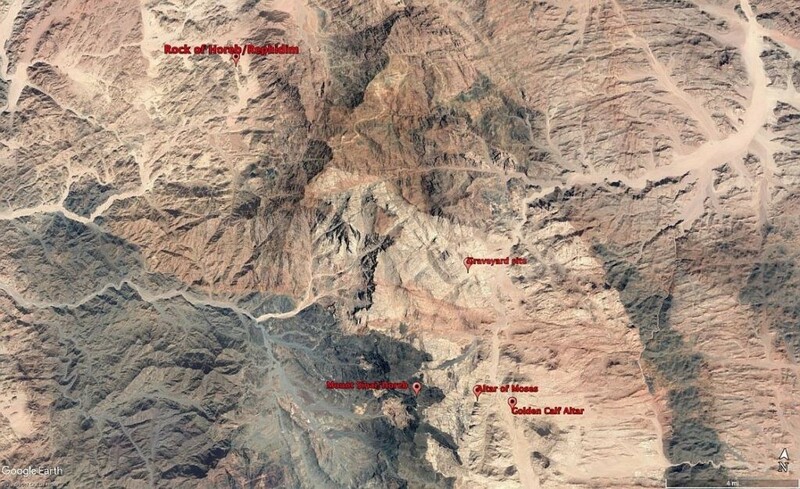 Image obtained via Google Earth. 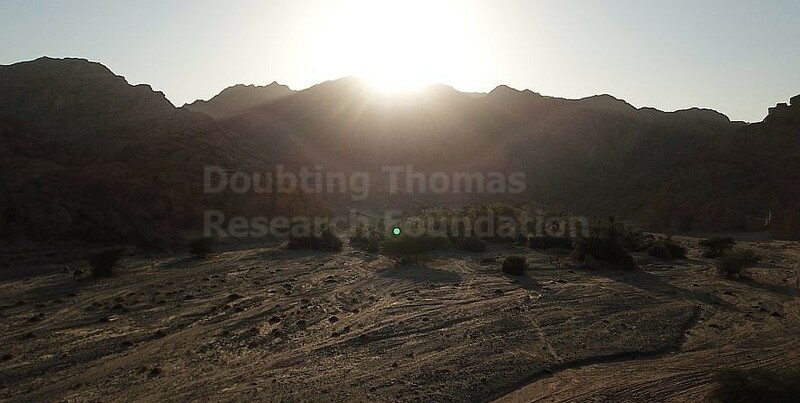 Sites marked in red are marked by the Doubting Thomas Research Foundation. Amazing! 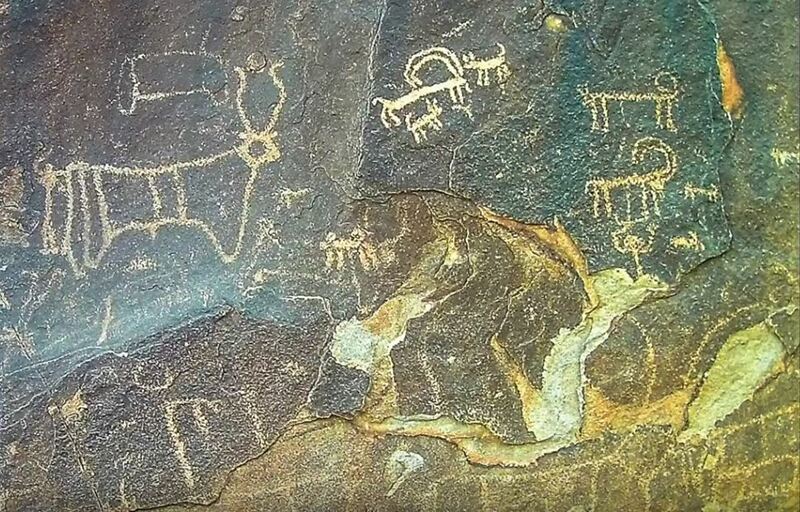 We need a book/booklet that shows all of the evidence so far. 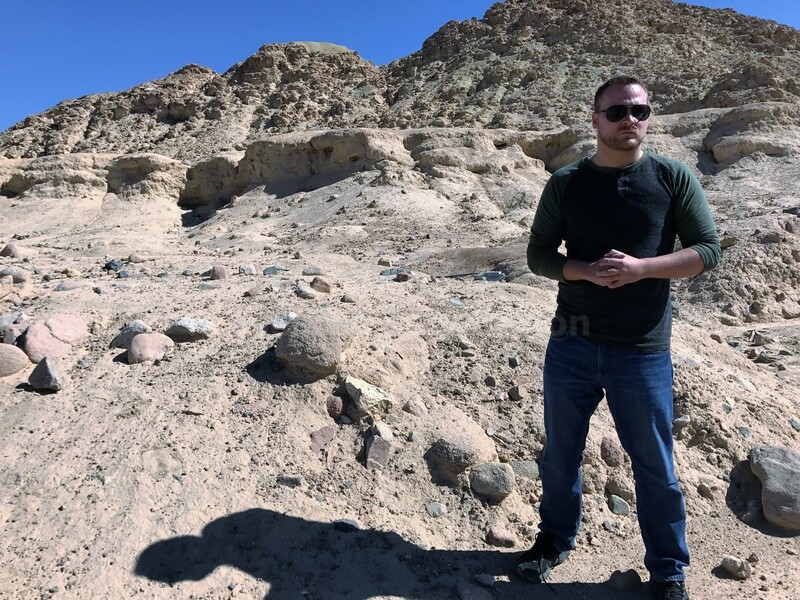 Far more proof than any other site so far. 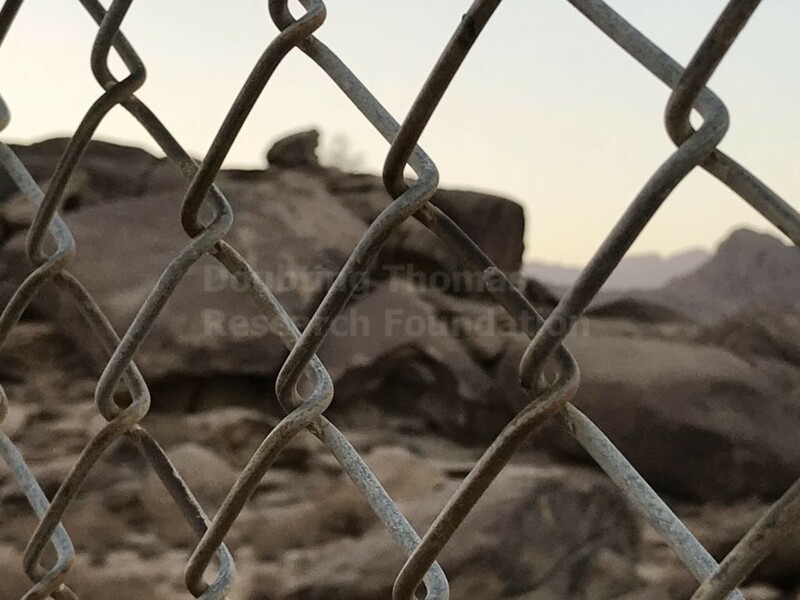 Thank you for helping to protect this site and for letting more people know about the site. 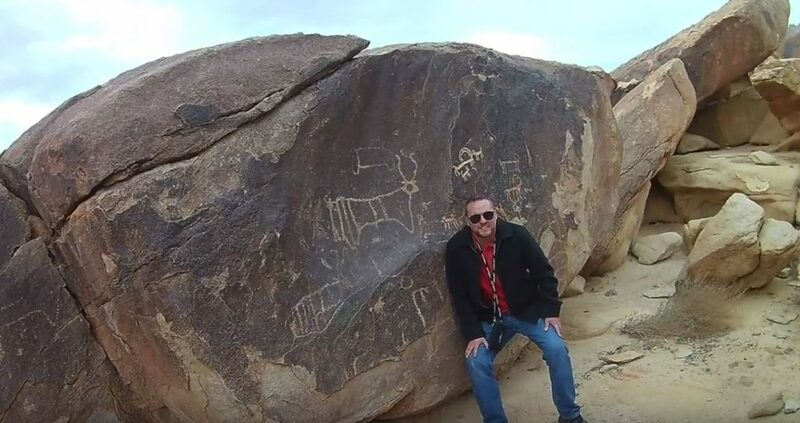 We have known about this location since the days of Ron Wyatt. 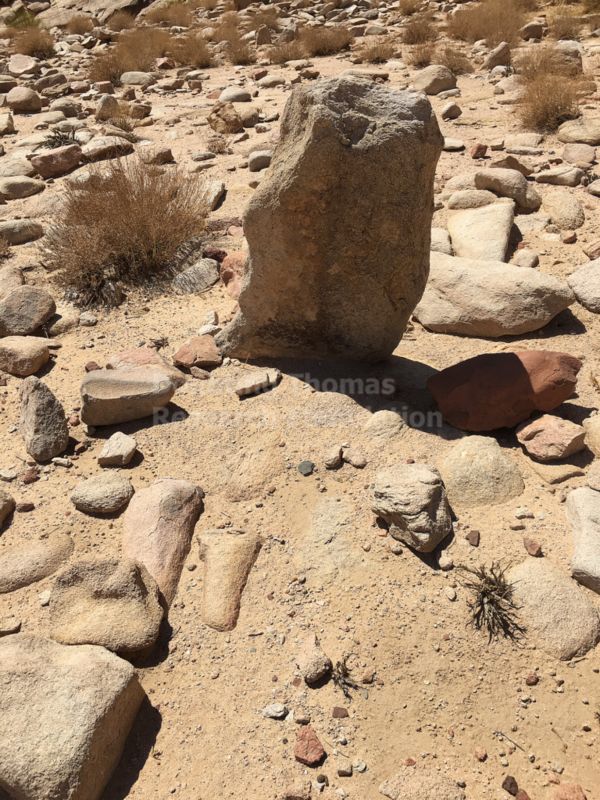 We heard him speak of it [on video] and saw pictures of the location made by Ron Wyatt and his associates. I have allso head Joel Richardson speak of it in person and have listened to his DVD presentation. We have spoken with our Bible classes about it. We wish you the best in your work and will be contributing as God allows. For the Petition, you should have an option for Mr & Mrs to allow married couples to jointly sign. Love your site! I have signed the protest. I am personally praying for Yahshua’s will to be done considering this issue. 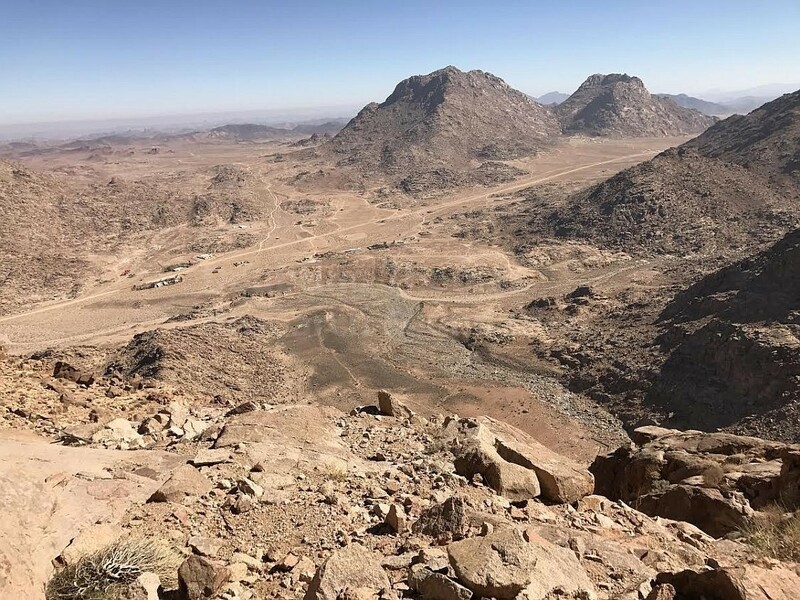 I personally hope they leave this land be! But perhaps God has something more he wishes to be revealed.